Diversity in microgel compositions for ink fabrication. A trio of researchers from the University of Pennsylvania have published a paper, titled “Jammed Microgel Inks for 3D Printing Applications,” on their use of jammed microgels as inks for bioprinting, in order to address the various limitations of 3D bioprinting with hydrogels. Researchers and scientists use 3D bioprinting to organize materials and cells into 3D structures, and while it can do amazing things, the technology still has a lot of challenges, like materials restrictions and achieving the correct resolution and stability for printed constructs. While soft hydrogel materials are often used in tissue engineering, thanks to tunable biochemical and biophysical properties, it’s hard to print them without using some sort of additive or modification. Jammed microgel ink fabrication, rheological properties, and extrusion. The microparticles found in jammed systems are packed pretty densely, and physical interactions with surrounding particles immobilize them. This results in macroscopic materials that behave as solids, until movement is induced by applied force. Jammed microgels work as bioinks because they allow cross‐linked hydrogel particles to be formed as an aggregate bulk, which can then be extruded as a stable filament without using any other material or having to engineer any interparticle interactions. The researchers formed microgel inks through the use of microfluidic devices. Jammed microgel ink printing on surfaces or within hydrogels. The team used norbornene‐modified hyaluronic acid (NorHA), poly(ethylene glycol) diacrylate (PEGDA), and agarose to make their microgels, which definitely displayed the kinds of rheological properties important for 3D printing, such as shear-thinning behavior, elastic response at low strains, and the ability to flow during extrusion and stabilize quickly after deposition. A modified Revolution XL 3D printer was used to fabricate the microgels into a four-layer lattice. Mechanical forces disrupted the 3D printed structures as expected, so the team used post‐cross‐linking to chemically link the particles together. “As an example, during the jamming process, additional cross‐linker (dithiothreitol) and photoinitiator (Irgacure 2959) were included, and ultraviolet (UV) light led to interparticle cross‐linking due to the presence of remaining unreacted norbornene groups. Printed and post‐cross‐linked lattice structures could subsequently be handled with forceps with no apparent loss in structural integrity,” the researchers said. “We believe the printing of jammed microgel inks opens up the possibility for the printing of a range of diverse materials and structures. To illustrate this, we utilized the gel‐in‐gel printing method of microgel inks into support hydrogels to print heterogeneous structures,” the researchers said. Printing of jammed NorHA microgel inks in diverse patterns within shear‐thinning support hydrogels. The research shows that microgel inks can definitely be used to 3D print heterogeneous structures without damaging any cells. Co-authors of the paper are Christopher B. Highley, Kwang Hoon Song, Andrew C. Daly, and Jason A. Burdick. Nanotechnology may seem novel and advanced, but it has actually been used for thousands of years. Metallic nanoparticles are present in glass and pottery from hundreds and thousands of years ago, giving the items a shiny, glittering look. In a paper entitled “Plastic embedded gold nanoparticles as 3D printing dichroic nanocomposite material,” a group of researchers discusses how they fabricated a 3D printable nanocomposite composed of dichroic gold nanoparticles and a 3D printable polymer. The nanoparticle solution was studied by transmission electron microscope (TEM). Once the gold nanoparticle solution was prepared, the nanoparticles were embedded in a 3D printable material that could be used with a standard off-the-shelf FDM 3D printer. The researchers used polyvinyl alcohol (PVA) as the carrier, as it is one of the most commonly used 3D printing materials, it is water soluble and can thus be mixed with the nanoparticles without need of changing solvent, and because it can be used as a capping agent for nanoparticles. The researchers compared TEM results of the original dichroic solution to the AuNP-PVA dissolved in water, and found that the nanoparticles were still of the same size and shape as the original ones, showing that the embedding in PVA does not influence the stability of the nanoparticles. Finally, they extruded the material to create a filament for FDM 3D printing. The small percentage of gold did not affect the printability of the PVA. The researchers then 3D printed a replica of the fourth-century Lycurgus cup and coated it in PDMS so it could hold water. Authors of the paper include Lars Kool, Anton Bunschoten, Aldrik H. Velders and Vittorio Saggiomo. Researchers at the University of Twente have developed a new laser printing technique that allows for the 3D printing of gold nanostructures, including complex overhanging structures. By pointing a very short laser pulse onto a nanometer-thin metal film, a tiny droplet of liquid metal is ejected onto the substrate, where it solidifies. The technique is called laser-induced forward transfer, or LIFT. The researchers have been using it to build tiny, complex structures out of copper and gold; the copper acts as a mechanical support for the gold. LIFT will enable the 3D printing of micro components for electronics or photonics. The example that the researchers use is a tiny helix, which could act as a mechanical spring or an electrical conductor at the same time. The helix is printed with copper around it, forming a copper box, which prevents a drop meant for a new winding from landing on the previous winding. After the helix is completed, the copper is etched away chemically, leaving a helix of pure gold, just a few tens of microns in size. The volume of the droplets is a few femtoliters, and have the diameter of a little more than one nanometer. A short pulse of green laser light is used to melt the gold and copper. The researchers were concerned that the two metals would mix, but that wasn’t the case. The drop by drop method used to build the microscopic structures results in high resolution, with a surface roughness of only 0.3 to 0.7 microns. The LIFT technique can also be used for other metals or combinations of metals. It has a lot of potential for use in applications such as electronic circuits, micromechanical devices and sensing for biomedical applications. Using copper as a “sacrificial” material allows for more complex structures to be 3D printed, such as those with overhangs, like the helix. This technique, like other additive manufacturing techniques, has the potential to save time and money while allowing for the production of intricate components. The research was carried out by the departments of Mechanics of Solids, Surfaces and Systems (MS3) and Design, Production and Management (DPM), both part of the Engineering Technology faculty of the University of Twente. The researchers also collaborated with DEMCON Corporation, a spinoff company of the University of Twente. Authors of the paper include Matthias Feinaeugle, Ralph Pohl, Ton Bor, Tom Vaneker and Gert-willem Römer. In Mexico City, a strange structure has been erected – it looks a bit like a crouching frog, or maybe an exotic flower. It was built using a special 3D knitting technique developed at ETH Zurich. The structure, called KnitCandela, is partially made from concrete, but its formwork is a knitted textile supported by a steel cable-net. The project, an homage to Spanish-Mexican architect Felix Candela, is a collaboration with Zaha Hadid Architects Computation and Design Group and Architecture Extrapolated. 3D knitting has been used before to produce things like clothing and furniture, but it isn’t often seen on this large of a scale. It took 36 hours for an industrial knitting machine to produce the shuttering of the formwork for the shell structure, following a digital pattern. The fully shaped, double-layered textile was knitted in four long strips, with the lower layer forming the visible ceiling. The upper layer contains sleeves for the cables of the formwork system and pockets for balloons. After the structure is coated in concrete, the balloons are popped, leaving hollow spaces that help save on material and weight. The structure was erected in the courtyard of a museum; the knitted formwork was tensioned between a temporary boundary frame and sprayed with a specially formulated cement mixture, just a few millimeters thick. Once it hardened, conventional fiber-reinforced concrete was applied. The knitted fabric, which was brought to Mexico City inside normal suitcases, weighs about 25 kilograms and the cable around 30 kilograms. Together, they are able to support more than five tonnes of concrete. KnitCandela’s technology was developed by Mariana Popescu, a doctoral student with Philippe Block, Professor of Architecture and Structure at ETH Zurich, and Lex Reitier, a doctoral student with Robert Flatt, Professor of Physical Chemistry of Building Materials. The technology is an evolution of the flexible forming technology developed for the HiLo roof, which the Block group developed for Empa’s NEST research and innovation building in 2017. Unlike the HiLo roof, which was made of a network of cables and a sewn textile, KnitCandela’s knitted shell was produced in one go. Using knitted textiles in construction simplifies the construction process for complex shapes, and also cuts down on material, labor and waste. It’s a lot faster, too. “It took only five weeks from the initial work until completion – much less time than if we were using conventional technology,” said Matthias Rippmann, project manager for KnitCandela and senior researcher in the Block Research Group. While 3D printing is being pursued with interest in the construction industry right now, 3D knitting is a new idea, but a promising one. Giant robotic 3D printers aren’t required for 3D knitting a structure like KnitCandela, either – all that is needed is a conventional knitting machine. , and violin maker Charline Dequincey wanted to find out, so they spent several months 3D printing and fine-tuning eight violins for the Ottawa Symphony Orchestra. The orchestra will play the 3D printed instruments in a performance called 3D String Theory, which will take place on November 4th. Creadditive is based in Gatineau with a satellite office in Quebec City. The company specializes in using 3D printing for things like heritage restoration, but creating eight 3D printed violins wasn’t a huge change for Lacombe. “Whether you’re designing a part for heritage, or a mechanical part in a car, or implants in the medical field or a violin, it’s basically the same techniques,” he said. Lacombe started by CT scanning Dequincey’s conventional violin, then converting the 2D file into a 3D model. It wasn’t quite as simple as just hitting “print” after that, though – plastic is heavier than wood, so the violins needed to be modified so as not to be too heavy. Dequincey gave regular feedback in order to achieve the best compromise between weight, design and sound. “Honestly, the first time I heard the sound, I was really impressed,” said Lacombe. The sound produced by the 3D printed violins isn’t identical to that produced by a traditional wooden violin, Lacombe said, but that wasn’t the goal of the project – the goal was to see what a new, digital manufacturing form could accomplish when combined with a traditional musical instrument. He doesn’t think that 3D printing will ever replace traditional handcrafting, as the sound just isn’t the same, but he does think that 3D printed violins could be valuable for entry level musicians who can’t yet afford a traditional violin. Music is one of the oldest art forms, so it will be interesting to see how the newest technology can alter the sounds of such a traditional instrument. 3D printed violins may not replace handcrafted wooden ones, but they can bring a new dimension to them – and make more people realize that 3D printing is capable of creating something truly functional and valuable. “People are starting to be aware that additive manufacturing is not a toy or a joke on the internet anymore,” said Lacombe. Eight women will perform in the 3D String Theory concert. You can buy tickets for 3D String Theory here. In a refreshing change of pace from most construction 3D printing, Denmark’s 3D Printhuset, which made a name for itself with a three year, government-funded research project into the state of 3D construction printing, takes a more realistic approach to large-scale 3D printing. This enables the company to deliver quality results, such as the Building On Demand (BOD), the first 3D printed building in Europe that met the necessary building codes. When demand started to increase for construction 3D printers, like the company’s BOD2 with a print speed of 1 meter per second, 3D Printhuset won the first ever EU tender for 3D construction printers. This led to a major decision: create a new company just for construction 3D printing. 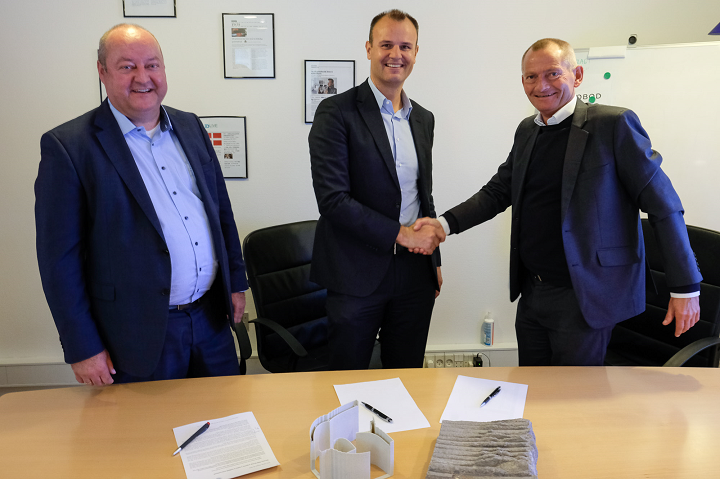 COBOD International, which stands for Construction Building On Demand, opened its doors a little over a month ago, and is now responsible for the manufacture and sale of 3D Printhuset’s BOD2. This week, PERI Group in Germany, which is one of the largest manufacturers and suppliers of formwork and scaffolding systems in the world, announced that it had acquired a significant minority stake in COBOD International. This investment by PERI is obviously a major endorsement for COBOD’s 3D construction printing, and is just the latest in a group of other investments made by several multinational companies in the conventional construction industry since 2017 into construction 3D printing. This obviously shows that the technology will continue to play an important role in future construction activities. As a result of this investment, COBOD’s 3D construction printers will be made available to all of PERI’s global customers. Signing the investment agreement. L-R: Leonhard Braig, member of the Group Management of the PERI Group; Christian Schwörer, Chairman of the board of the PERI Group; and Henrik Lund-Nielsen, CEO, COBOD International. Happy Halloween, fair readers! We’re giving you a treat today instead of a trick – our latest edition of 3D Printing News Briefs. First up, Materialise has completed a mammoth 3D printing project, and Australian manufacturing company C-Mac is embracing the technology for the first time. atum3D has revealed what new product it will be bringing to the upcoming formnext 2018. Finally, a group of French researchers compared powder bed fusion and binder jet 3D printing as possible methods for fabricating sand molds. The massive Mammoth of Lier, named for the Belgian city where it was discovered, lived during 20,000 BC, and has been on display at the Royal Belgian Institute of Natural Sciences in Brussels since 1869. But thanks to the hard work of Belgian 3D printing company Materialise, the woolly mammoth skeleton is now back home in Lier…a 3D printed version of it, anyway. Earlier this summer, a multidisciplinary team of Materialise engineers and production operators, paleontologists, and archaeologists began work on the mammoth 3D printing project, which is Materialise’s largest yet at 3.5 meters tall. Materialise optimized the 3D scans of each of the mammoth’s 320 bones in order to replicate its fossilized skeleton, then digitally reconstructed it and prepared each file for 3D printing. Fittingly, Materialise used nine of its large-format Mammoth SLA 3D printers, the only machines it makes but does not sell, to complete all 1,260 hours of 3D printing. The company’s Design & Engineering team also created a modular carbon fiber structure that could support the skeleton from the interior. Now, the 3D printed replica of the mammoth is back in Lier, just in time for the doors to open at its new city museum. Australian manufacturing company C-Mac Industries Cooperative Ltd, headquartered in Sydney, recognized that times were changing in the industry, and not exactly for the better. Between 2008 and 2013, the country lost one manufacturing job every 19 minutes, and C-Mac realized that it needed to evolve. So in the middle of 2017, all of the staff members agreed to become business owners, and C-Mac went from being a family-owned company to a more socially responsible workers’ co-operative. In order to sustain and keep growing its business, C-Mac spent a ten-month period adopting 3D printing and creating parts for over ten different industries, as the technology is rapidly becoming a preferred approach to developing product models. “You have to embrace change,” said C-Mac’s General Manager Steve Grlyak. ” We have seen so many manufacturing companies in Sydney go bankrupt because they are not willing to change or are slow to adapt to change or have over capitalised on the wrong equipment. It’s not easy to adopt a new type of thinking, but C-Mac knew that 3D printing was the future of the industry and, with the help of its 50 years of experience in manufacturing, stepped up to the plate. At the upcoming formnext 2018, open platform DLP 3D printing specialist atum3D will be introducing its new, redesigned Operator Station software, which comes with proprietary MAGS AI technology. Thanks to an intuitive user interface and touchscreen support, the software makes it easy for users to prepare print jobs for the company’s DLP Station 3D printers. Operator Station lets users duplicate parts, or fill available build volume, with the click of a button, and its MAGS AI will automatically adjust a part’s orientation and generate the necessary supports. “We’re very excited to be back in Frankfurt for the third time in a row to show our most recent developments. This year, the main spotlight is on software, one of the three pillars on which atum3D was built, together with hardware engineering and resin chemicals. When creating the all new Operator Station software from the ground up, we took special care to incorporate our user’s feedback and requests. That’s why we created a highly intuitive interface that takes you from part import to final print job in just a few clicks. The intelligent approach of our proprietary MAGS AI technology, which is the abbreviation of Mark, Adjust & Generate Supports, plays an essential role,” said Tristram Budel, CEO at atum3D. At formnext, atum3D will also be introducing its new Industry Excellence Pack for material scientists and research institutes, as well as an open resin platform for the DLP Station 5, which will be showcased at the event. Visit atum3D at booth 3.1-B19 to see its new Operator Station with MAGS AI and the DLP Station 5. A trio of researchers from Centrale Nantes and École Normale Supérieure de Rennes in France recently published a paper, titled “A review on the additive manufacturing of sand molds by binder jetting and selective laser sintering,” that analyzes the current techniques of the casting industry for using 3D printed sand molds. Specifically, they looked at SLS and binder jet 3D printing. In the paper, the researchers analyzed patents, case studies, and scientific articles, as there is limited data about 3D printed sand molds in other studies. The research team got together because there’s a lack of resources and interest in 3D printing sand molds, and they wanted to provide a more comprehensive analysis of the topic. The paper highlighted the current gaps in the field, as well as proposed some key perspectives for possible social implications. Co-authors of the paper are Tugdual Amaury Le Néel, Pascal Mognol, and Jean-Yves Hascoët. Sterne Elastomere, a company located in the south of France, specializes in manufacturing items out of silicone materials for industries such as food and drink, mass transit, medical, nuclear, and pharmaceuticals and cosmetics. Two years ago, Sterne made its move into the 3D printing world and debuted its SiO-Shaping 1601 silicone 3D printer at K 2016, a top plastics and rubber trade show, for the first time. In order to provide its clients with 3D printed silicone prototypes that possessed properties similar to that of the final product, Sterne developed its technology so it could deposit filaments of 100% UV-cured silicone. It’s definitely not easy to 3D print with silicone, due to properties that make it unable to be heated and extruded in the same way that typical thermoplastic materials can be, but companies like Sterne, Wacker Chemie, and Fripp Design Research have been making great strides over the last few years. Over the last two years, Sterne, which has over 20 years of experience in the silicone industry, has been working hard to refine its 3D printing silicone technology, so it can be a viable alternative option for customers looking to meet their technical needs. Now the company is bringing its SiO-shaping 3D silicone printing method to COMPAMED 2018, a trade fair for medical suppliers and manufacturers which begins in a little over a week in Düsseldorf, Germany. The company’s SiO 3D silicone printing has been further refined since it was first introduced. In 2016, it promised a minimum 3D print layer height of 0.25 mm, but can now achieve a minimum of 0.1 mm (100 microns). Its SiO-Shaping 1601 silicone 3D printer offers a maximum print volume of 205 x 200 x 100 mm, along with hardness from 30 to 60 Shores A.
Sterne’s silicone 3D printing can help all of its customers with their fast prototyping needs. But its specialty is manufacturing thin, accurate silicone products for the medical sector that meet the necessary aesthetic and technical needs. “Whether High Consistency Silicone Rubber (HCR) or Liquid Silicone Rubber (LSR), Sterne masters a large range of manufacturing process such as extrusion, molding, making, over-molding inside ISO 6, ISO 7 and ISO 8 cleanrooms,” the company’s release states. In addition, Sterne’s SiO silicone 3D printing also offers a full panel of colors, including phosphorescent, translucent, and opaque, which is available for colors like red, yellow, black, and green. However, these colors are only available for materials that meet the necessary quality requirements according to the FDA or USP class VI medical grade. You can see the company’s silicone 3D printing prowess for yourself at COMPAMED from November 12-15 in the Düsseldorf exhibition center. To rediscover, or see for the first time, Sterne’s range of products for the medical sector, visit the company at Stand L02 in Hall 08b. While many automotive manufacturers have been using 3D printing in their design and manufacturing processes, BMW has been a leader in the field, using the technology for over 25 years. The company has used 3D printing for everything from roof racks to more advanced concepts. There are plenty of reasons for BMW and other automotive manufacturers to turn to 3D printing, like time and cost savings and the ability to produce lightweight, efficient, complex parts, but there are also some benefits of 3D printing that are simply fun, like customization. BMW’s new MINI can be customized for users in a multitude of different ways, such as 3D printed patterns, pictures, shapes, and letters on the dashboard and glove box. You can even request an LED light that projects your name on the street when you get out of the car, according to BMW. The company is the first to take automotive personalization to this level, and it’s doing so with the help of Twikit, a Belgian company whose software platform emphasizes 3D printed customization possibilities. BMW MINI customers can design their own customized cars online, and the digital files are sent to the production facility, where they are manufactured using 3D printing, laser cutting and other advanced technologies. Twikit was founded in 2012 by Hoppenbrouwers, Martijn Joris and George Lieben. The company now has 33 employees and is becoming active worldwide, particularly in Europe and the United States. Besides working with BMW, Twikit also offers its personalized production services for prosthetics and orthotics, jewelry, electronics, windows and doors, and more. The company prides itself on being able to help companies smoothly and seamlessly bring together multiple digital production techniques such as 3D printing, CNC machining and laser cutting. Will automotive customization catch on? We’ll have to wait and see. Will people value their own personal touches so much that they’ll be willing to pay €119 to have LED lights announce their presence any time they leave their car? Most people will likely still be swayed more by things like advanced safety features and seat warmers, but some certainly will be attracted to such customization offerings, and Hoppenbrouwers believes that many people will – that the future will be personalized. The US military has been using 3D printing for quite a while in all of its branches, and now in South Korea the Army is field testing 3D printed concepts through a newly established facility called Rapid Fabrication via Additive Manufacturing on the Battlefield, or RFAB. This is the fourth deployment of the $250,000 facility, but unlike other deployments that lasted only a month, this one will last an entire year, operated by a team of six soldiers. The Army chose South Korea as the newest location for the facility because of its near-deployment nature. “We’re trying to validate the use of additive manufacturing in the future of the [Army],” said Chief Warrant Officer Dewey Adams. The facility, which has five 3D printers, can quickly produce parts for tanks, trucks, rifles, and many other things the Army might need. While the parts produced by 3D printing may be small, the impact of the technology on the Army has the potential to be great. Some of the most critical parts have been extremely small, said Adams. For example, a fire suppression cap for a Mine-Resistant Ambush Protected vehicle costs only $2.51 – but it takes 126 days to ship from the United States, and if it is missing or broken, it can put the entire vehicle out of commission. 3D printing a replacement takes less than a day. The Army isn’t just producing spare parts, either. It also 3D printed about 75 training mines and mortars. There are limits to the program, however; the 3D printed replacement parts are just temporary until permanent ones arrive, and the 3D printers in the RFAB can only produce plastic and some carbon-reinforced materials. The team also can’t 3D print parts that would cause serious harm if they were to fail, such as rifle firing pins or parts for helicopters. The program still does the Army plenty of good, however, with its quick turnaround times and ability to be transported from location to location. “We want the asset as close to front line as we can,” said Adams. So far, Adams’ unit has produced about 65 different parts and about 500 pieces of equipment in three months with a success rate of about 65 percent. Even failed parts are valuable, too, as they offer insight into the limits of the technology that can be used at the Army Armament Research, Development and Engineering Center (ARDEC) in Rock Island, Illinois. Parts that succeed are also sent to ARDEC, where they are saved as blueprints to a military-wide data cloud that can be accessed by any branch – an ever-growing library of digital parts that can be downloaded and 3D printed instantly. Adams said that the US Marines and Navy are further ahead of the Army when it comes to 3D printing, but the Army is working to catch up. According to Billy Binikos, an ARDEC representative who works with Adams, the Army could adapt RFAB facilities for regular use by 2025. “The only limitation is our imagination,” Adams said about the potential of 3D printing in the field.